From our family to yours… Sorelle brings you superb style, peace of mind, and a sound investment. 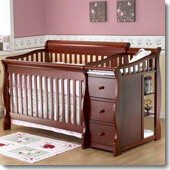 Sorelle Furniture offers complete crib collections that will grow with your infant and toddler for many years to come. Sorelle’s stylish collections in traditional & modern European designs are custom crafted with quality materials for your ultimate satisfaction.